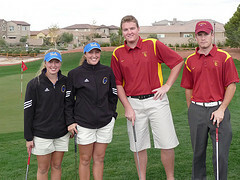 CGA is once again a sponsor of the NIRSA Foundation Golf Tournament. A great way to kick off the conference, registration begins at 6:30am on April 1. 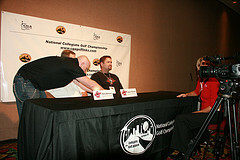 National Collegiate Golf Championship sponsors will be on hand with generous contributions… Matrix Fitness will be providing beverages and an Elliptical Fitness Trainer for one lucky participant; FRS will be giving away one trip to Las Vegas for NCGC; and almostGOLF with Skills Challenge demonstrations. Don’t forget to come meet Mike, Cindy & Kim at our Expo Booth #939! Learn about enhancing golf programming on your campus, gain some new resources and apply to host a National Collegiate Golf Championship Local Qualifying Tournament Best of all – test your skills on our putting green and qualify to win $5,000! The CGA Educational Session will be held on Thursday, April 2 from 11:15a – 12:30p. Come hear more about campus golf programming and the 2009 National Collegiate Golf Championship. 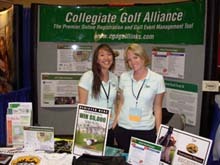 Recreational golf programming for campuses of all sizes will be discussed, as well as information on how your college or university can get involved with the 2009 National Collegiate Golf Championship in Las Vegas! Winning team qualifies for the National Championship. Please visit us at www.cgagolflinks.com for more information. Or… come by our booth at the NIRSA Conference! New this year, the PGA has initiated a relationship with the CGA to further enhance golf programming on college campuses. The PGA has renamed and restructured their Golf for Business and Life Program to now focus on the recreational collegiate golfer, as PGAU. Play Golf America University (PGAU) is a PGA of America college and university golf program, designed to teach and engage students in the game of golf through PGA Professional instruction and other golf programs. Play Golf America University, while open to all students, is especially targeted for juniors, seniors and graduate students to help them to learn to play golf as well as understand how golf can be employed as a business tool as they enter the professional world. 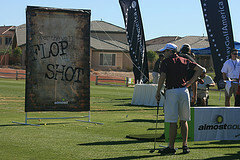 The PGAU program includes four elements, one of which is recreational golf programming. Matrix Fitness has graciously committed to another season of support by providing beverage carts to each school’s Local Qualifying Tournament, Matrix will also be sponsoring a Tournament Directors trip to Las Vegas. Matrix is committed to providing quality commercial products, at the lowest total cost, while exceeding customer expectations for service. With consideration given to both the club owner and the end-user, MATRIX combines visionary aesthetics, new manufacturing techniques and thoughtful features. CGA is happy to have Matrix on our team, and is appreciative of their continued generous support. FRS Healthy Energy is redefining the energy category, providing “healthy energy” without the spike and crash associated with the leading energy drinks. Our patented formula is based on a powerful antioxidant called Quercetin, commonly found in apple, grape and onion peels. Clinical studies show that Quercetin helps unlock the body’s natural adrenaline and improves mental acuity – ever important when standing over that 15ft birdie putt on the 18th green! Add FRS Healthy Energy to your game and enjoy sustained energy throughout your round. FRS Healthy Energy is available in many forms, making it a more convenient choice – Ready-to-Drink cans for grab n’ go energy and refreshment, Chews for anytime/anywhere, Powders to energize and flavor your bottle of water and Concentrate for that planned energy need. Whether in the golf cart or on the golf course, FRS Healthy Energy makes it easy to get your energy. 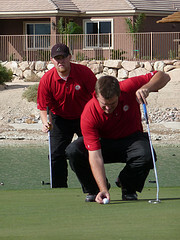 FRS is proud to sponsor the NCGC Championships and the Pac-10 Challenge. If you’re new to FRS, check us out at www.healthyenergy.com. 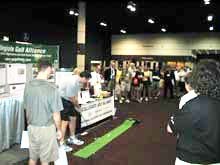 PLUS… look for the FRS “Get Into the Q” Chipping Contest at the NIRSA Foundation Golf Tournament and you could win a trip to Las Vegas. Returning champions Kyle Lickenbrock and Craig Heinzman from Southern Illinois University, Edwardsville shot a 63 to defend their title in the 2-person scramble event. Both players were happy to be back, this time competing in the Alumni & Community Division. The pair defeated Student Division winners from Rutgers University, Adam Satkowski and Doug Christian (64) and Faculty & Staff Division winners Kerry Geroux and Dane Reiter (66) from Southern Mississippi. 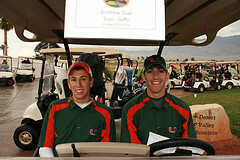 The 2008 event had 146 golfers representing 55 schools competing for top honors. The Pac-10 Challenge, a year long competition that integrated three main Rec Sports programs into one challenge; Fitness, Club Sports and Intramurals. Thirty days of fitness leading into a fitness challenge where each campus logs in their hours of workouts. The Club Sports Challenge will involve 4 regional tournaments in Rugby, Ice Hockey, Lacrosse and Ultimate Frisbee. The Intramural challenge comprises of 4 sports, Flag Football and Golf in the fall and Basketball and Softball in the spring. Each sport has a regional location for campus champions to travel to compete against the other Pac-10 schools. �I flew to Las Vegas wondering if the event was real, or one of those "sounds too good to be true" experiences. The event surpassed my expectations�. - Peter St Pierre, Western Kentucky Univ. �Through the efforts of everyone involved, our expectations for a first-rate event were met beyond our imagination. You were a vital part of making this tournament the success that it was, and I thank you for helping us produce a memorable post-season tournament in its inaugural year�. �Your time and support are extremely valuable and your experience helped to put together another great tournament for the alumni�.